Transparency Market Research (TMR) finds that the global spirodiclofen market is highly consolidated with only two established players. The two leading participants in this market are Bayer CropScience and Hangzhou Tianlong Biotechnology Co. Ltd.
TMR anticipated that the revenue of the spirodiclofen market was valued at US$119.9 mn in 2013 and expected to expand with a CAGR of 6.0% to attain the value of US$172.1 mn by the end of 2020. 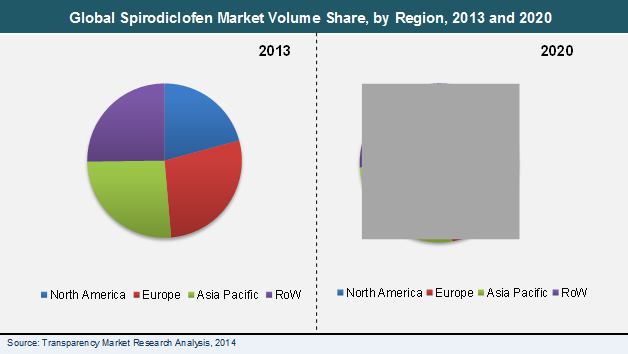 On the basis of crops, in 2013, fruit segment accounted for the leading share in the global spirodiclofen market. Rising demand for the spirodiclofen on the several fruit crops such as almond, avocado, pear, apple, grapes, lime, and lemon is fuelling growth of the global spirodiclofen market. On the basis of region, in 2013, Europe is accounted for largest share in the global spirodiclofen market with more than 25% of the market. This growth of Europe market can be attributed to the extensive use of chemicals on crops such as almonds and walnuts. Spirodiclofen has extensive usage in several number of fruit crops including almond, peach, apple, pear, grapes, avocado and lemon. The efficiency of spirodiclofen is higher than other chemicals to reduce infection of the insects or diseases. Spirodiclofen helps to keep crops disease-free and healthy which lead to substantial growth of the crops and yield. These factors are boosting adoption of the spirodiclofen which is driving growth of the global spirodiclofen market. Also, the industry is looking for the aggressive chemicals or solutions which are able to protect the crops from insects and diseases. The demand for the spirodiclofen is growing from the fruit producers which is fuelling growth of the global spirodiclofen market. Spirodiclofen are used on the other than fruits crops such as ornamental plants which are grown for the decorative purposes in gardens and vegetables to reduce attack of disease and pests. Increasing cultivation of ornamental plants which is known as floriculture mainly for decoration and beautification of some places are boosting adoption of the spirodiclofen which is likely to drive growth of the market. The other factors such as growing production of crops such as tomatoes are projected to support growth of the market for spirodiclofen globally. Despite of these growth opportunities, some of the side effects of the spirodiclofen such as pulmonary edema or bronchitis and acute lung injury in the case of long term contact with the chemical is limiting use of the spirodiclofen. Additionally, due to rising awareness level among consumer about health and increasing preference of organic farming and foodstuffs are restraining growth of the global spirodiclofen market. Nevertheless, its efficiency and compliance with the requirements of producers and the standards of integrated pest management (IPM) are creating lucrative opportunities in the global spirodiclofen market.